My Autobiography – School Excursions! I don’t remember much about the zoo. I do remember seeing a tiger and elephant and I also remember that my leg was paining due to the long walk. I don’t remember being thrilled at seeing the animals in cages, even at that young age. I am not sure what others felt. The Mahabalipuram trip was interesting. Of course, the sculptures and their beauty are lost on children, but we were slightly older by then (maybe 6th or 7th standard) and hence it was more like a ‘friends outing’ together. Only the teachers were always around us and kept ordering what to do and where to sit, etc. Obviously we didn’t go to the beach, but we had a lot of fun exchanging video games (hand-held models) and playing so many different games for a considerable amount of time. The real fun was during our 9th and 10th standards. That was when teachers asked us where we wanted to go and we unanimously said, ‘Dizzee world’. 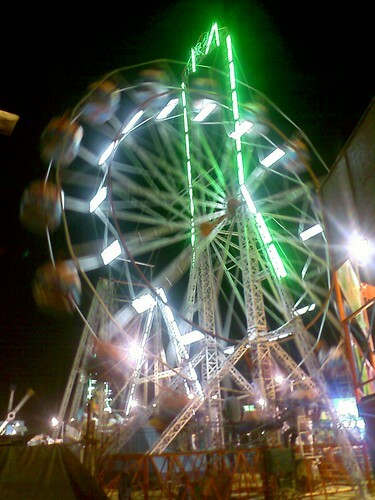 It was a theme park in the ECR and had all kinds of fun rides. The best thing about it was, except a few rides, we could go in all other rides for any number of times. That concept made us jump from one ride to another. Literally! While going and coming back, we were singing non stop and there were two buses (carrying one section each) and both the drivers were under enormous pressure to overtake the other bus. They too joined in the fun! We went to the same Dizzee world later in the 11th standard too, but the group in that school was pathetic. I really missed my close friends from the earlier school and for the first time felt how important it was to have great buddies in order to enjoy trips to the maximum. Isn’t that true? Isn’t it the people who make trips more enjoyable than the places we visit? THe one good thing that happened to me in school was the Treks and tours .. each year we had them and I visited so many beautiful places. Do you still have contact with the old friends? Nearly all of my son’s friends are abroad now! Slowly he has lost contact with them. Yes, the company is important while going on a trip! I can understand how you enjoyed the Dizzee world trip. My relative is a teacher for II std. Every year they take the children to Maya jaal because it is easier to take care of the children inside a closed compound of the complex. They won’t lose them! One movie and video games, over! Not much. Some of my friends are in India or come to India at times, and I am in touch with a few of them. Once guys get married, they are unreachable! I guess they can’t get permission to see friends? Kids like video games and movies. So, Mayajaal might be a good option for them. That complex is boring for adults! At least for me! awesome..yes the PT but i hated it 😛 especially when it was before dawn and in winters! After the year where I passed out from 12th class, I heard that our school has restricted ALL excursions to one-day trips strictly, and that too for only alternate classes. I am not quite sure what prompted them to do so. But I felt really sad for the kids. They are missing out on the joy of togetherness and travel in the process. School should not be all about studies, studies and more studies. I went to a trip for 3 days in my 11th standard. Had it been a year earlier, I would have enjoyed it very much. Anyway, good to know that you enjoyed such trips in your school days. The school/college excursions are some golden memories..that never fade! I remember my school excursions very well….they were always single day trips…Guindy park, vandalor zoo, vedanthangal, mahabalipuram was always the excursion for about 10 years…until MGM was opened! Good old days! All the singing and dancing in the bus, roaming around with friends and no worries of studies!!!! So much of Fun!!!! Ofcourse its the company that makes a trip enjoyable! I had a bad experience of school kids on excursion to planetarium while we were there. as soon as lights went off, they were just whistling and talking and shouting during the show.